2XU Transition Bag Reviewed - To Buy or Not in Apr 2019? For many runners, the thrill of running is found when striving to reach higher and higher goals. These goals can start small, like completing a 5K, but they can become progressively more difficult as the runner improves in strength and endurance. These runners will often find themselves constantly striving to run longer distances over shorter periods of time until they reach the holy grail of fitness challenges: the triathlon. This combination of running, cycling, and swimming over long distances is incredibly difficult. It requires a runner’s body to be in top physical condition and will demand every last ounce of strength in their body to complete. In order to assist individuals who are brave enough to attempt this strenuous ordeal, companies like 2XU have developed accessories with practical triathlon applications. Alongside several articles of compression gear that will help to reduce muscle soreness while improving blood flow, 2XU has also designed a backpack geared specifically toward storing all of the necessary components a runner needs to run, cycle, and swim their way to the finish line. The 2XU Transition Bag was designed with triathlon runners specifically in mind. Although its design isn’t intended to improve the wearer’s running ability like the brand’s popular line of compression gear, this bag is intended to improve the wearer’s completion time by facilitating an easier transition between activities, which is the reason for its name. For starters, this backpack comes with two sizeable side pouches that can be used to hold large water bottles. Triathlons are grueling affairs and any athlete that engages in one will inevitably need a great deal of water to stay properly hydrated throughout its duration, so the inclusion of these easily accessed hydration pouches is extremely convenient. Additional pouches are included on other areas of this bag, although they may not be as easy to access while running. One pouch is completely waterproof which will come in handy for storing fragile valuables and electronics during the swimming portion, and a small compartment on the front can easily store a bicycle helmet for the cycling portion. As a result of these features, this 2XU product goes above and beyond the traditional backpack design in order to accommodate this particular athletic ordeal. Although the 2XU Transition Bag is intended for use while running a triathlon, the nature of its design means that it can also be used for other physical activities. For example, the impressive hydration storage and weight-distributing straps make this a fantastic bag for hiking or trail running. Additionally, the waterproof wetsuit pouch makes this a fantastic storage choice for individuals who enjoy surfing or boating. Finally, the helmet storage compartment means bicycle commuters can take advantage of this 2XU product for work or school purposes. For the most part, this transition backpack from 2XU wasn’t designed with breathability in mind. Its primary design focuses were durability and versatile storage, much like most other backpacks currently sold on the market. However, there are some elements of its design that allow for a modicum of airflow while being worn. First, the entirety of this backpack is made from nylon. The most significant benefit of this textile is its high durability which is why it can be commonly found in emergency equipment such as parachutes. This material is very thin while still offering impressive resilience to the elements, which means that a somewhat decent amount of ventilation can be guaranteed. However, there are only a few places where breathability is explicitly intended: around the side water bottle pockets and near the shoulder straps. These areas are made up of a perforated mesh pattern in lieu of the firm and opaque style that comprises the rest of this transition bag, which works well for wicking moisture and circulating cool air around the wearer’s body. When engaging in an athletic pursuit as lengthy and difficult as a triathlon, every ounce of baggage counts. For this reason, it is instrumental that athletes bring only the absolute essentials. What’s even more important is that the form of storage they choose to use for this physical endeavor is comfortable enough to not interfere with their ability to perform at their maximum potential. These are all facts that 2XU understands, as can be clearly seen in the design of their transition bag. 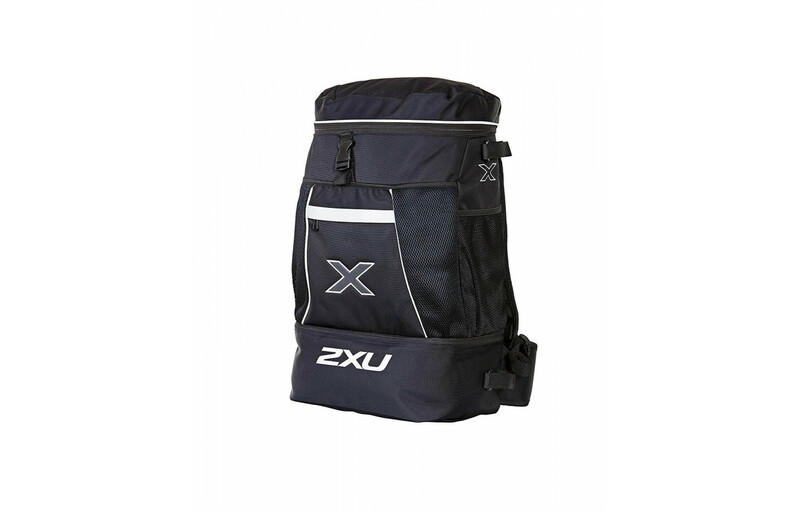 The 2XU transition bag uses two thick shoulder straps as its main method of attachment to the wearer’s body. These straps are made from nylon but reinforced with versions of this surprisingly versatile textile that provide additional cushioning and breathability. As a result, wearers won’t have to worry about the straps digging into their arms and shoulders while running, cycling, or swimming. To further prevent discomfort for the wearer, additional horizontal straps can be fastened near the wearer’s lower chest and upper groin. These extra straps ensure that the weight of any items stored in this 2XU bag isn’t placed on the wearer’s back, spreading it more evenly across their body in a manner that helps to avoid fatigue. Other than this, the only major comfort-related design feature is the use of thin and lightweight material for the rest of its construction. Unfortunately for some potential customers, the 2XU Transition Bag doesn’t have alternate sizes. Instead, its one-size-fits-all design is intended for use by adults with an average body size; those who are on the taller or shorter side may experience some discomfort wearing this product as a result. When it comes to the size of this product’s storage capacity, the 2XU Transition Bag is much more impressive. Starting with the hydration pouches, the two mesh pockets on either side can easily hold enough water to ensure that the user is proper hydration for the entirety of a triathlon, which is no laughing matter. Additionally, three large compartments have also been implemented into its design: one for a bicycle helmet, one for a wetsuit, and one for miscellaneous accessories and essentials. These different pockets are all impressive in terms of size, resulting in a truly extraordinary capacity for the wearer. One unfortunate drawback that presents itself as a consequence of this storage capacity is the potential for burdensome weight issues if the user attempts to completely fill this bag. Another admittedly minor downside to its size is the fact that this 2XU product can be difficult to condense for storage when it isn’t being used. Aside from these issues, however, this product is impressive and highly functional thanks to its size and storage capacity. When designing the textiles that will be ultimately used for the construction of backpacks and similar storage bags, many manufacturers will cut corners and reduce product costs by mixing a more durable or comfortable material with cheaper synthetic fabrics. The result is a product that offers a fraction of the benefits derived from its premium materials that will inevitably fall apart in a short amount of time. Fortunately, 2XU bucks this trend with the design and manufacture of its transition bag. As was previously mentioned, this product is made from 100% nylon, an extremely resilient fabric commonly used for products that need to be extremely durable for safety reasons. This should be enough assurance to potential customers that this product will be able to withstand the hazards and stress encountered during a typical triathlon. However, there are some reviews that have been left online questioning the structural integrity of this product. A few individuals have remarked that portions of the 2XU Transition Bag have peeled or torn, with others stating that the zippers can come apart or leak moisture in the case of the waterproof wetsuit compartment. It appears that these situations occur rarely; however, these problems can be easily remedied if they occur within 12 months of purchasing thanks to 2XU’s extended warranty. On its own, the 2XU Transition Bag doesn’t come with any accessories. The closest thing this product has to an accessory is the way in which its shoulder straps function; the addition of multiple horizontal fasteners means that wearers can adjust the distribution of its weight on their back and enhance their stability. Other than this, the primary benefit this product provides in terms of accessories is its compatibility with them. Since this bag was intended to provide the necessary functionality for triathlon participants, the list of accessories with which it is compatible is impressive. One example is its hydration storage functionality, which is substantial and easily accessed while in use. This can be attributed to the mesh pouches placed on either side of the bag, allowing for easy removal and placement during a cycling or running session. And speaking of cycling, a dedicated compartment for storing a bicycle helmet has been added to the front of this 2XU pocket for convenience’s sake. Finally, the most impressive compatibility this product provides for accessories is the waterproof wetsuit compartment found in the very bottom; although it won’t work with 100% effectiveness without a few caveats, this is an impressive design feature that will certainly come in handy before or after a swimming session. Although functionality is the most important aspect of any product designed to improve the life of a triathlon athlete, style and fashion are worthwhile considerations for many prospective customers. This is the reason for the popularity of brands like Under Armour and Body Glove since they offer an enticing synthesis between form and function that can be considered part of the athleisure design movement. Unfortunately, 2XU doesn’t provide a similar sense of style, at least as far as their triathlon transition bag is concerned. As was mentioned in an above section, this product doesn’t come in any alternative sizes. It was designed with a one-size-fits-all mentality, meaning that individuals with body shapes that are outside the traditional mold will most likely feel unsatisfied with the effectiveness of this 2XU product. Additionally, there are no alternative colorways for customers to choose from, meaning that they will be unable to coordinate this bag as effectively with other parts of their wardrobe. Instead, this product comes in all black, showcasing a utilitarian aesthetic meant only for getting the arduous task of a triathlon accomplished. The closest thing to a stylistic accent is the addition of reflective material over the company logo and a few other sparse locations, although this addition is more for safety concerns when exercising in low-light environments. For the most part, a backpack isn’t expected to be very expensive. This can be largely attributed to children since they are the most common users of backpacks for storing books and other school supplies. However, backpacks that are meant for more arduous activities such as hiking and running will usually have a higher build quality which inevitably results in a higher price tag. The 2XU Transition Bag is a product that costs more than $100 on average. This is more or less to be expected in terms of high-end packs but it still places this product on the higher end of the price spectrum. The justification for this increased cost is a bit difficult to parse: while the material used for its construction is certainly of a high quality, it isn’t expensive enough to entirely justify this product’s price. Additionally, the size of this transition bag, while substantial, is also not reasonable as a cause for the considerable price tag. The closest thing to a reasonable justification that this product offers for its cost is the water-resistant wetsuit compartment. This is something not commonly seen in products like these and it definitely provides this 2XU bag with an advantage over competing products. Ultimately, the quality of this triathlon accessory is high enough that paying the full price for this product can be justified. 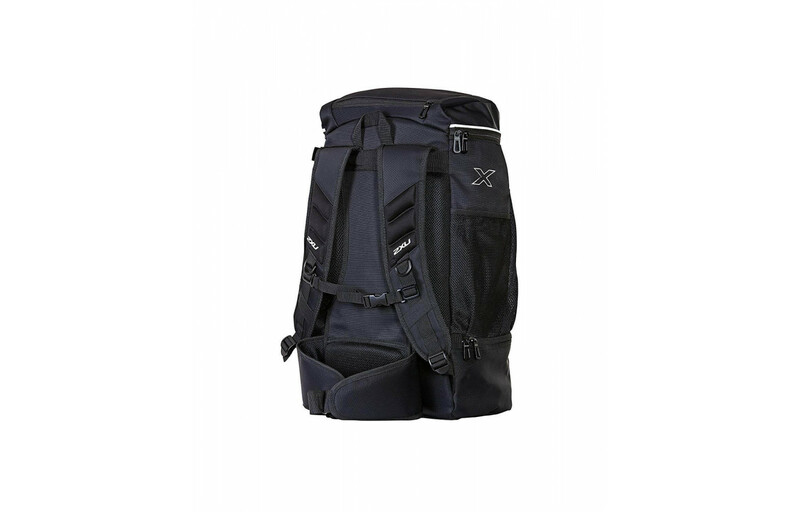 Thanks to the exceptional build quality and impressive features provided by the 2XU Transition Bag, the potential users of this product are numerous. The obvious first choice is triathlon athletes; thanks to the high compatibility with their other accessories, this can be a major boon that will help them to finish their first event or beat their best time in subsequent events. Additionally, this may be the only demographic that can justify paying the admittedly steep cost for owning this bag. With that being said, the average runner, cyclist, or swimmer can find a lot to love about this product as well. Unfortunately, this product is not only listed at a higher than average price by the manufacturer; it is also difficult to find when searching for third-party retailers such as Amazon. Still, hunting down one of these 2XU accessories can provide real benefits to a trail runner, camper, commuter, or surfer, just to name a few. The sky’s the limit when it comes to physical activities in which a healthy human can engage, and 2XU has released a product that can keep up with the most difficult and intense of them.